On May 10th, 2012, 41 sinkholes collapsed the southern suburbs of Liuzhou, Guangxi Province, China, damaging 143 houses, eight factories buildings, and three commercial buildings. Lei (2013) revealed that groundwater dynamics, contributed to by the daily rainfall of 169.7 mm, led to soil particles running off (seepage erosion) resulting in the sinkholes. It is crucial to identify the critical parameters of seepage erosion that forms sinkholes. 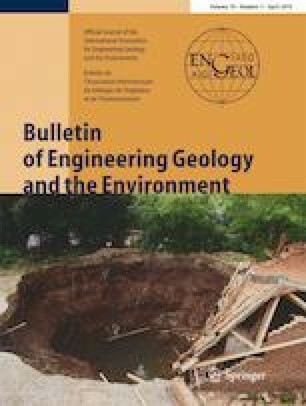 This paper analyzes critical parameters in the study site, establishes the pipe flow model of seepage erosion, and deduces parameter expression using its theories. We devised experimental equipment designed to simulate the process of seepage erosion and test the critical shear stress (τcr) of soil samples from the field. Additionally, we measured the diameter (d) of pores in the field soil using a scanning electron microscope, and calculated the critical groundwater velocity (Vcr). As the result, we found that the collapsed sinkholes in the study site were formed by groundwater with a velocity of 7.652 × 10−5 m/s (or 0.459 cm/min). This work is supported by the social development fund of the support plan projects of Guizhou Science and Technology Department, China (No. 2846).